Washed up action hero, Riggan Thomson, is desperate to prove his artistic chops. To do this, he decides to adapt, direct, produce and star in a Raymond Carver play. However, he soon finds himself challenged at every turn: by the fragility and egotism of his fellow actors, by the snobbery of theatre critics and - more than anything else - by his own tremulous sanity. Hanging on to everything in his life by the thinnest of threads, Riggan gets advice from an unexpected source - his alter ego, Birdman. Director Alejandro González Iñárritu wanted to shoot his entertaining drama, Birdman, as if it were a film comprised of one single shot. While edits were made (unlike last year's single shot film, Victoria), Birdman’s digital wizardry and stunning cinematography are no less impressive. Cinematographer, Emmanuel Lebezki, creates amazing non-stop, swooping and soaring shots that add so much to the frenetic nature of this film. They give us a real sense of theatrical atmosphere and also provide a welcome release from the building dramatic tension. 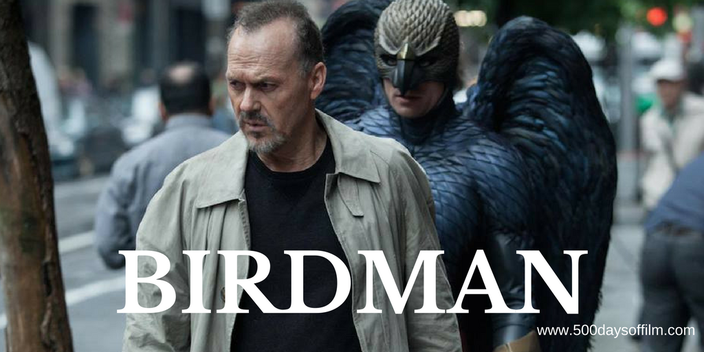 The cast of Birdman is superb and all give truly remarkable performances. However, the film belongs to one man - Michael Keaton. Keaton is incredible in this movie. His performance is both funny and desperately sad. Iñárritu has great fun with his lead actor - playing with art’s imitation of life. Keaton, of course, played an action hero of his own, Batman. Indeed, we find out that Riggan retired his Birdman wings in the same year (1992) that Keaton decided to hang up his cape. Riggan is attempting a great acting comeback and so, in many ways, is Keaton. This is an actor who, before Birdman, has been seen in precious few challenging roles in recent years (Out Of Sight and Jackie Brown excepted). In real life (whatever that means), Keaton’s comeback is assured (since Birdman he has featured in Oscar-winning film, Spotlight, and McDonalds bio-pic, The Founder) and his future looks bright. Riggan’s future is less certain - much is left, thanks to the use of magical realism, to audience interpretation. I would recommend Birdman - it is a remarkable, groundbreaking piece of cinema. However, more importantly, this film is also entertaining and enjoyable. Special mention has to be made of Birdman's score. The film's loud percussive accompaniment has certainly proved divisive. I find myself somewhere in the middle. For the most part, I thought the score added tension and drama to the scenes. Occasionally, it was a tad jarring and annoying - a bit like being beaten over the head. Cinematographer, Emmanuel Lebezki, has stated how he wishes that no one would discuss how movies are actually made. In an interesting interview with Arri News he says that he would rather his audiences didn't notice how a film has been shot. Lebezki shot the movie partly with Steadicam and partly with a handheld camera. Lebezki also worked with Iñárritu on his equally acclaimed project - The Revenant. Click here for my review of The Revenant. Have you seen Birdman? What did you think of this film? I’d love to know - leave me a comment in the box below! Thoroughly enjoyed this! I agree with you about the score; it was uncomfortable at times. But the cinematography was superbly done and the acting impressive. I'm not a huge fan of an ending open to interpretation though. I like to know what's happened for sure! I loved how they demonstrated the behind the scenes tension and drama of theatre. It had me wanting the show to be a success! Thanks Robert! I know what you mean about the ending. I like closure too! If you liked the cinematography, go see The Revenant. I think Emmanuel Lebezki is a very good bet for the Oscar this year.